United in Support of Labour? Congratulations to The Daily Referendum for unearthing this gem. My comments in Italics. 66% of Unite members would not vote Labour if a General Election was called today. Then why are all 2 million members expected to pay £7.12 a year each to support the Labour Party? Only 36% of Unite members believe that it was right for the union to donate £500,000 to Labour in the last three months. Only 31% of Unite members believe that it is right for the union to donate any further large donations to the Labour party. Then why are all 2 million member expected to pay £7.12 a year each to support the Labour Party? 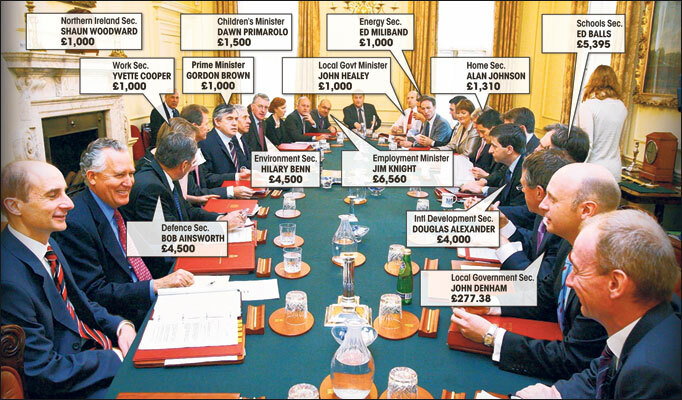 HALF the Cabinet, including Gordon Brown and 12 of his ministers, are bankrolled in their constituencies by Unite. Unite in the form of Charlie Whelan, against the wishes of their members. Isn’t that their objection to Lord Ashcroft? caught some of post PMQ discussion on radio 5 and listened to the medacious Kitty Usher prognosticate on all things Ashcroft without once conceding that new labour are a cretinous bunch of talentless gits. She of the new kitchen at our expense amongst other things… get rid of these people!!! Why oh why isn’t someone from the Conservatives giving Labour some stick about Lord Paul? I can answer that question. Me, me, please Miss. Oh. Everybody already knows why. Excellent post, Anna. I thought that Mrs T had ended the ‘political levy’ (or at least allowed members to opt out) back in the early 80s? Or have they found another way of funding their mendacious and dishonourable political wing? I deliberately used the words ‘expected to pay’ becasue you are right, Mrs T did insist on an opt out – however, I offer you this comment from ‘anonymous’ on the Daily Referendum site to explain just how difficult it is to do so….. Anonymous. Opt out of the political levy? Have you ever TRIED? I have, and believe me, it wasn’t easy! First thing you are up against is a disapproving & polically biased shop steward ( sorry, I mean Union Representative). It took me months to sort out – I rather think that there was some deliberate heel dragging, and I had to pay equivalent amount to a (Union) charity. I was never actually sure that my money went to the charity, and was glad to leave that job! This is what the general public should be told, to show only a minority of Unite Union members support Labour. The Blogoshere is so much more informative than the mainstream media. THis is a ridiculous line of attack. Look, in a democracy individuals are entitled to join and form organisations. Those organisations then take democratic decisionss on behalf of their membership. If people dislike the decisions they are entitled to leave or to change them. Unite has democratic structures to facilitate this. See my comment above yours as to how difficult it is to opt out of the political levy – why not an ‘opt in’ levy for those who feel inclined to support politicians? An opt out levy, when you have to face a militant shop steward and get him to organise your ‘alternative donation’ is hardly a democratic structure to facilitate this……. When I was a member of the AUEW in the 70′s you could tick a box if you wished to donate to ,gggrrrrrrrrrrrrrrrr ******god dammmit *******grrrrrrrrrr . Unite is as democratic as the Parliamentary side of my arse. Wheelan is an out and out thug. THis is a ridiculous line of attack. Look, in a democracy individuals are entitled to join and form organisations. Really? I thought they were unofficial closed shops whereby if you didn’t join the union, in addition to missing out on an opportunity to fund the Labour party, you also gave up any right to representation should your employer shaft you. If that’s not the case, it’s certainly the impression given out. Perhaps Unite is spending too much on Labour’s PR and not enough on their own? I can’t speak for Unite, but, if you want to opt of my union’s political fund, all you have to do is tick the appropriate box on the application form – still, it’s quite fun being “the enemy within” again. It fairly takes you back, so it does – nostalgia ain’t what it used to be. Oops – that should, of course, say “opt out”. Good coverage on the BBC 1 Six O’ Clock News. You still don’t get it, they just don’t care anymore. They don’t care who is in charge, the general consensus is, whatever! I attempted this not long after Government of the day introduced the measure. I was working for 6 months for a plastics manufacturer and decided to assert my right to not fund the Welsh Windbag. At 6am the following morning I was literally pinned to the wall by a very angry Shop Steward and two of her equally large muscled sisters — choose your favourite scene from Cell Block ‘H’ and you’d get the idea — where upon they proceeded to persuade me how ‘needy’ the Labour Party were for my small contributions to their funds. That single experience has forever cemented the idea that the Labour movement are nothing more than thugs, open, if necessary, to using violence to extort money. It may be a harsh judgement but its one that I learnt in the most painful way possible… and its not an experience I’ve forgotten (nor forgiven) over the years. I used to be a Unite member & as the place I worked wasn’t a closed shop it was relatively easy to op out of the levy. Like Vimes I too enjoyed the feeling of being ‘the enemy within’. However, when they began harassing all members to vote Labour & refused any discussion on the subject – certainly my emails on the subject were ignored – I left altogether. i understand that some unions have a rule that allows a block contribution to be made to labour party funds in addition to the the political levy in which case the decision to contract out is effectively taken away from the individual member unless they can get the rule changed. I’ve nicked this entire article and posted it on our blog in Wigan … because here in Wigan the big enemy is the Labour party. Hope you don’t mind. If you do, then just say so and I’ll remove it. Otherwise … thanks very much. Useful. Engineer on A Brain Teaser for You. Bob on A Brain Teaser for You. ThePresentOccupier on Is this Justice for Stephen Lawrence? Elena ‘andcart on A Brain Teaser for You.